Strengthening the Black Voice at the multi-ethnic table. I have tried to stay off Social Media for a few months. Most of my posts have been forwards of what others have written. This is mainly because something didn’t feel right after Ferguson, New York, Cleveland, Baltimore, etc. It’s taken me a couple of months to put words to the confusion I have been experiencing. In short, no real change has occurred. There is a spectrum, at least in my mind, a healthy person or organization travels down when it comes to any issues, but particularly issues of race and ethnicity. The first stage is Awareness. This is self-explanatory. It is simply becoming aware of injustice that exists that wasn’t on our radar before. It is discovering the realities of unemployment, underemployment, unequal education, mass incarceration, and systemic injustice are drastically and disproportionately affecting certain ethnic groups while the absence of these issues allow other groups to flourish. It’s akin to the televised police assaults on peaceful demonstrators during 1960s that horrified the country, or seeing systemic poverty experienced by Hurricane Katrina victims in New Orleans. The second stage is Action. 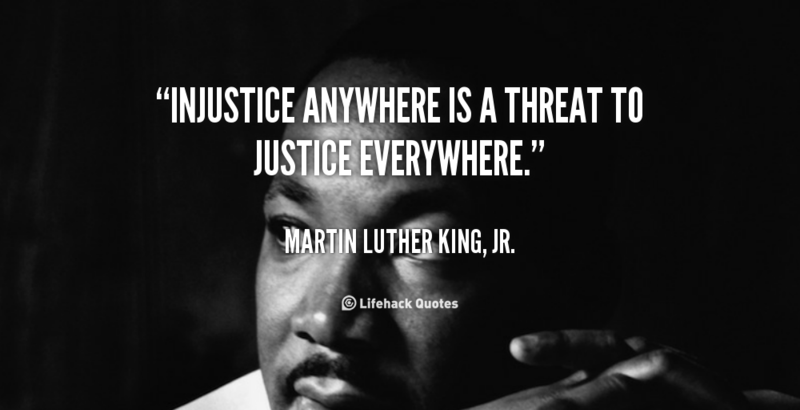 Dr. King’s timeless words remain true, “Injustice anywhere is a threat to justice everywhere.” It is not enough to become aware of these issues. One must be moved to action. As a follower of Jesus, I must be allergic to systemic injustice and inequality whether at home or abroad. Where do I volunteer, where do I give leadership, where is the place in the mud for me to throw my hands and clean up this mess…until it is clean. The third stage is Advocacy. Beyond taking action, I must call others to act as well. I must use my words, my voice, my influence to bring others into this spectrum of Awareness, Action, and eventually Advocacy themselves. Herein lies my issue. The U.S. has been parked at Awareness since 1954 when Brown v. Board of Education declared separate but equal unconstitutional. 60 years later, not by law but by choice, we are still separate, and still unequal…and it is acceptable. It is so bad today that merging the two communities means eventual gentrification. I am consistently teased about dressing nicer than circles I traverse. I don’t know where we are going for lunch or where meetings will be held. I don’t know if those locales have Black customers and I don’t want to be followed or have my humanity questioned because of the color of my skin. Black people for years—really decades—have spoken about all these issues, ethnic, economic, and otherwise. Those concerns have fallen on deaf ears, or they have been drowned out with “Black on Black crime” as an adequate rebuttal—which is important, but does not address the aforementioned problem or help create any type of solution. The Western, Evangelical world vacillates between Awareness and Action. Part of it is just as apathetic and silent as it was when Dr. King was alive and well. (We should not be able to listen to a 50 year old sermon that sounds like he is grieving the death of Freddie Gray last month.) Part of the Evangelical world is unaware, and unaware on purpose. Pastors in the cities where the unarmed shooting deaths have occurred have not mentioned them in their pulpits. Not in a sermon, a prayer request, or an observation. Another section of the Western Evangelical world inches toward Action but only briefly. That’s the lament, the calls, buying a meal or coffee to listen. If they are really concerned, they may even give a one-time financial gift as a sign of their commitment to racial reconciliation. While those actions are appreciated, still, nothing has changed. Everything I have mentioned thus far is the perspective of the unaware. It isn’t the Black perspective. We have been Aware since the day we got here, since elementary when kids began making comments about our hair, or skin color, clothes, and music. We have been looking for Action from the church to address not just the deaths not of unarmed Black people, but the systemic issues that perpetuate the majority of problems that exist in the Black community. Not a sermon, not a book, not a panel discussion, not a seminar, actual action steps. “How are we going address education and employment issues or mass incarceration as a community?” Questions like that aren’t asked. Instead, what we do hear is, “These things are systemic and we can’t change that,” or “These things take time.” Both of those statements are not true, and honestly, are sin. Nothing we are truly committed to takes time, or as much time as we think, and “waiting” invariably means “never.” The Gospel of Jesus at the core revolving around His death and resurrection, is liberation for the oppressed, the prisoner, and the captive. If the gospel preached doesn’t addressed and tear down strongholds, it simply is not the gospel. It is not Good News at all. Has slavery ended? Yes. Was separate but equal declared unconstitutional? Yes. Have we changed the core identity of our country, community, churches, ministries, organizations so the systemic issues are tackled or at least moved towards elimination? No. Action, true action, means coming to terms with what multi-ethnicity and racial-reconciliation truly mean. For some groups, racial-reconciliation and multi-ethnicity means have diverse groups in the room only and having nice brochures with different people of color all smiling. It doesn’t mean sharing power or restructuring to ensure resources withheld for centuries are now accessible to bring real change. For another group, my group and others like it, Action means justice. It means equality. It means never being silent. It means tackling head on the issues that caused the problems in the first place. It means solving the funding problems, the hiring problems, the lack of cross-cultural competency in supervisors. It means not only listening to the marginalized, but bringing them from the margins to the middle. Look at Acts 6 when the Greek widows are overlooked in the daily distribution of food while the Hebrew widows are not. Read the rest of the book to see if that systemic issue came up again. It didn’t. The Christian community took real action and solved the issue. They came to terms with the real problem and solved it, permanently. We have yet to do that as the church, as Christian community, and from what I can see, we aren’t planning to do so. Advocacy becomes insulting when Awareness and Action are at the same level they were in the 1950s and are temporary. 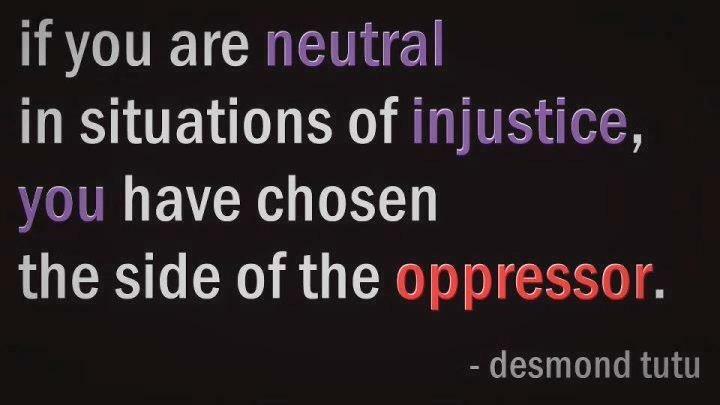 There are diverse groups of people out there that really want to see change happen episodes like Baltimore and Ferguson never happen again, but the best we offer is silence, apathy, and ignorance. I don’t affirm a riot. Ever. Riots, however, do get people’s attention. (People didn’t listen to Dr. King until Malcolm X affirmed violent responses.) That’s really one of the main reason these shootings have made the news, and perhaps the only reason you are reading my blog right now. That riot helped raise Awareness. But that’s really all that’s happened.